Bringing your dog on vacation with you just adds to the fun and alleviates the worry of not knowing what’s happening with your dog while you’re on vacation. But, if you have never traveled with your dog before, there are many things to consider before embarking on your trip. As with any vacation, it’s important to plan in advance. If your dog has never traveled in the car before or for only short trips, make sure to do a few practice drives to get your dog used to the experience. Before you leave on your trip, there is some preparation to make sure you dog is happy and safe. 1. Feed your dog a light meal three to four hours prior to departure. Don’t feed your furry friend in a moving vehicle-even if it is a long drive. 2. Exercise your dog before you leave to tire him out and lose some of that pent up energy. 3. Leash, collar and ID tag. You never know if your dog will run out when traveling. Having an ID tag is always important, but especially when traveling. 4. Food, water, bowls. Bring along enough of the food your dog is used to eating. Bring along plenty of water, too – and bowls, of course. Your dog might get a little car sick and keeping the food and water consistent will help but not in a moving vehicle. 5. Blankets and baggies. Bring blankets for bedding, and in cold weather, for warmth. Bring waste disposal baggies for parking lot rest stops as you would on your normal daily walk. Some dogs love to get in a car, hang their heads out the window, and revel in the experience, jowls and ears flapping in the breeze. But that’s not a good idea, especially on a road trip or really ever! And if you stop suddenly, your dog could come crashing into the front seat! When choosing a crate for your dog, it should be large enough to allow your dog to stand up completely inside and turn around, but there shouldn’t be so much room that the dog can slide around inside in response to the car’s movements. It should be well-ventilated, and structurally sound. 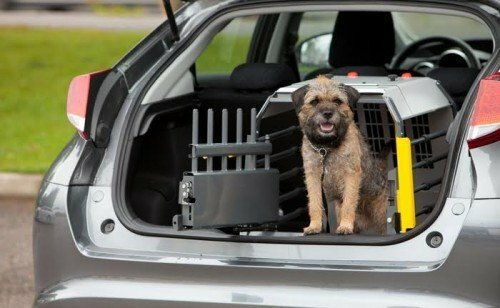 And it’s important that the crate be securely fastened in place; a loose crate isn’t much of an improvement over a loose dog. Plan on making frequent stops, just as you would if small children were along for the trip. Frequents stops and bathroom breaks are a great way for everyone to burn off any pent-up energy and will help to make your dog a happy traveler. Just be careful that your dog doesn’t run out when you let him out of the car and put on his leash beforehand. With preparation, the right crate, and a little practice before your road trip, your dog will be the perfect travel companion and happy to partake on your vacation!